Bill has been a great friend to the Celtic & Irish Cultural Society and had been a regular attendee at local events and a huge supporter of our efforts. Bill was proud of his his roots, born in County Waterford in 1939, he migrated to England in the early nineteen-fifties and subsequently worked tirelessly for the Waterford Association. Long before our association was formed, Bill had been instrumental in organizing events for the Irish community including the Irish Festival at Roundwood Park and the Saint Patrick’s Day Parade. Bill’s involvement with the Irish community in Britain is extensive and many would regard him as a pioneer. 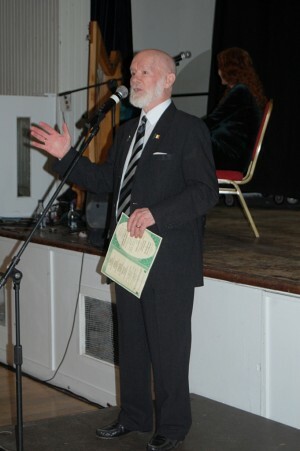 He was one of the founders of Haringey Irish Centre, which recently celebrated its 30th anniversary, led the Council of Irish County Associations and acted as an officer of the Federation of Irish Societies (now Irish in Britain). He was also a leader in other ways. Ever wondered how the London Saint Patrick’s Parade always made it to its destination on time? Well, that was Bill. Not only did he help make it happen during the organising phase, he also acted as the pacer at the front of the parade! Outside of his work for the Irish community, when in London, take a look around. Bill has left his mark there too. In his career, Bill worked in the building trade as a tower crane driver and helped build the skyline of London that we see today. Our thoughts are with Bill’s family at this time. Bless you Bill and rest well.